The microcontroller clock is the key to do anything, because everything is based and works due the clock signal. So understand the clock is vital to work with any microcontroller. 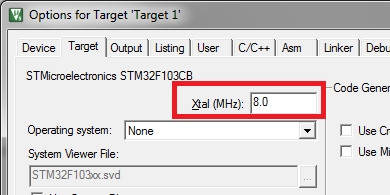 Here you can take a look in the STM ARM Cortex-M3 clock and how to analyze the instructions time using the Keil uVision IDE simulator. selected as default CPU clock on reset. 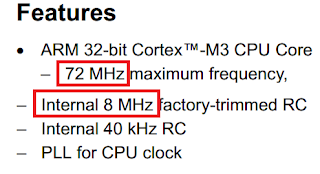 But how can it reaches 72 Mhz if has just a 8 Mhz internal oscillator? this is done using a technique called PLL (Phase-locked Loop), which can multiply this 8 Mhz input clock and output a higher clock, achieving the 72 Mhz as maximum frequency. Due the "performance analyzer" precision of 1 us, we see 13,88 nanoseconds (0,01388 us) as 0,014 us ! That's all, now try with a delay function!